We’re excited to announce a new and incredible way to jump into the hero-shooter, Battleborn! Starting today players can experience unlimited competitive multiplayer for FREE with the Battleborn Free Trial. Players can now pick up Battleborn as a free downloadable experience that grants UNLIMITED access to all competitive multiplayer gameplay modes and maps, without any time limits or level caps. To keep things fresh, there is a weekly rotation of six heroes from the roster of 30 total heroes. Progress with each hero and player account progression is also permanent, so when the same character comes back around players can pick them up where they left off. To download the Battleborn Free Trial, head to the PlayStation 4, Xbox One, or Steam store page and search for Battleborn. Each page has a “Try Now” button to download the Free Trial. Already own Battleborn? Then you’re a Founder! Keep on reading to find out what being a Founder entails. The Free Trial is now available globally on Steam and Xbox One, and is available in the Americas on PS4. For Sony Europe and Sony Japan, the Free Trial will be available starting June 13, 2017. PS Plus and Xbox Live Gold memberships are required to play the Free Trial. New players won’t have to worry about matchmaking against a team with Command Rank 100 and legendary gear out of the gate. With the launch of the Free Trial, we’re also introducing a queue specifically for new players. This queue was created just for new and lower rank players to learn the ropes without being matched with more experienced players. Even if you’re a quick learner or an experienced MOBA player, we wanted to give you enough time to find your Battleborn play style and favorite heroes. Once a player masters Battleborn’s mechanics and reaches Command Rank 20, the Novice Queue will disappear and they be able to join other Battleborn players in the regular queues. If you’re new to Battleborn, or just feeling a little rusty, take advantage of the new Training Modes, including an Incursion Tutorial to build up competitive multiplayer skills, and The Dojo, where players can test drive all 30 Battleborn heroes against waves of minions, regardless of whether they’re unlocked outside of The Dojo. Players can also head to either digital or retail stores to upgrade to the full game and unlock all 25 base characters, all eight Story Mode missions and the Prologue, as well as permanent access to private matches. Upgrading is seamless and any player going from the Free Trial to the full game will receive in-game credits for any duplicated content that was purchased a la carte. Additionally, character challenges and masteries will carry over with the upgrade, and players will be granted access to earn the character masteries that are only available through Story Mode missions. PlayStation 4, Xbox One, and Steam achievements or trophies will be granted upon upgrading to the full game. In order to complete the transfer of challenges, masteries, achievements, and trophies, complete the task one more time by hopping into a match or mission to complete the action (ex. get a kill, play as a Peacekeeper) and earn the corresponding reward. Anyone who’s already purchased and played the retail version of Battleborn prior to the launch of the Free Trial (June 6, 2017) has been awarded Founder Status. Founders have been here with us honing their skills in multiplayer matches and protecting the last star from Rendain and the Varelsi, and we’re proud to reward these veteran players with the Founder title and Founders bonus content, including Legendary Gear, 1,000 Platinum, 50,000 Credits, Loot Packs and more, plus an exclusive “Founder’s Crown” Flair item. What’s flair? These special pieces of gear have visual components for your hero such as ears, horns and headwear. Flair has a chance to drop from any loot pack, and is a guaranteed drop from the Magnus Loot Pack, a new loot pack introduced with the arrival of the Free Trial. 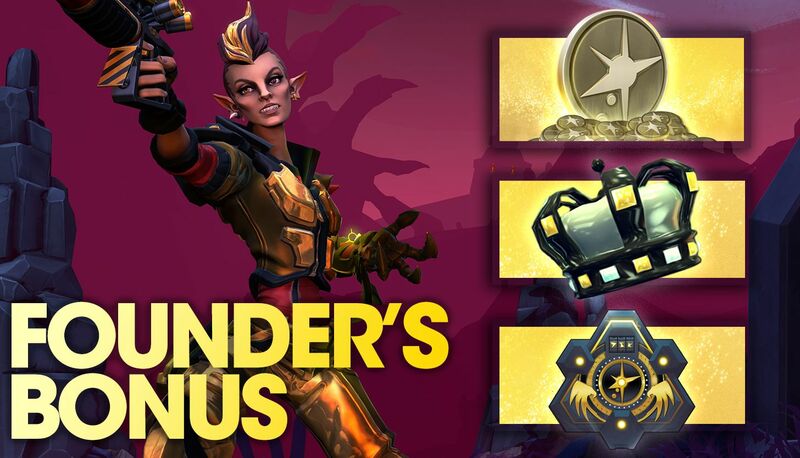 For complete details on the Founders Bonus, check out the post here and if you’re a veteran player we invite you to join the Reddit community here to pass on your Battleborn experience to the new heroes arriving daily. Where can I download the free trial? The Battleborn Free Trial is available on PlayStation 4, Xbox One, and Steam. Search for Battleborn in the PlayStation, Xbox, or Steam stores and head to the store page. Each page should have a “Try Now” button to download the Free Trial. I’m a veteran Battleborn player. How can I confirm that I received the Founder’s Bonus? Everyone who owned and played Battleborn prior to June 6th, 2017 was granted the Founder’s Bonus. To confirm you received the Founder’s Bonus, head to the Command center in Battleborn. On the top left-hand of your screen, you should see an additional 1,000 Platinum and 50,000 Credits by your gamertag. For additional details on the new features of the Battleborn Free Trial, check out the complete FAQ here. If you have any questions and run into any issues, please reach out to us at 2K Support.